New boss John Sheridan saw Newport claim a hard-fought draw in his first game in charge thanks to a Lenell John-Lewis equaliser against Exeter. Sheridan only took over as manager at Rodney Parade on Friday after Terry Butcher's departure the previous day. He saw his side fall behind to Exeter when Joel Grant took Jordan Moore-Taylor's cross and cut inside to score. But Newport fought back as John-Lewis pounced after Troy Brown blocked Alex Rodman's initial effort. 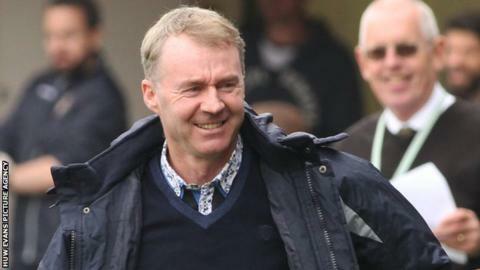 Newport County manager John Sheridan told BBC Wales Sport: "We played very well, I couldn't have asked any more from the players. "The endeavour and some of the football we played at times was really good. "It's always difficult when you're bottom of the league, you're always looking up at everyone and it was a difficult game against Exeter, I've always liked the way they play. "But the players really responded to the new manager coming in and they gave me a performance I was really pleased with." Match ends, Newport County 1, Exeter City 1. Second Half ends, Newport County 1, Exeter City 1. Janoi Donacien (Newport County) wins a free kick in the attacking half. Foul by Tom Nichols (Exeter City). Attempt missed. Medy Elito (Newport County) left footed shot from outside the box misses to the right. Joel Grant (Exeter City) wins a free kick on the right wing. Corner, Newport County. Conceded by Jordan Moore-Taylor. David Noble (Exeter City) is shown the yellow card for a bad foul. Lenell John-Lewis (Newport County) wins a free kick in the attacking half. Foul by David Noble (Exeter City). Attempt missed. Matt Oakley (Exeter City) right footed shot from the centre of the box is close, but misses to the left following a corner. Corner, Exeter City. Conceded by Joe Day. Attempt saved. Christian Ribeiro (Exeter City) right footed shot from outside the box is saved in the bottom right corner. David Noble (Exeter City) wins a free kick in the attacking half. Medy Elito (Newport County) wins a free kick on the right wing. Substitution, Exeter City. Arron Davies replaces Will Hoskins. Substitution, Exeter City. Tom Nichols replaces Lee Holmes. Substitution, Exeter City. Alex Nicholls replaces David Wheeler. Attempt saved. Alex Rodman (Newport County) right footed shot from outside the box is saved in the centre of the goal. Attempt missed. Matt Taylor (Newport County) header from the centre of the box is just a bit too high following a corner. Corner, Newport County. Conceded by Troy Brown. Goal! Newport County 1, Exeter City 1. Lenell John-Lewis (Newport County) left footed shot from the left side of the box to the bottom right corner. Substitution, Newport County. Alex Rodman replaces Scott Boden. Lee Holmes (Exeter City) wins a free kick in the attacking half. Corner, Exeter City. Conceded by Tyler Blackwood.